If you are embarrassed because of missing or seriously decayed teeth, don’t hide your smile any longer. Our dental office can help you improve your appearance to give you greater confidence and improved chewing and biting ability, allowing you to enjoy your favorite foods with ease. 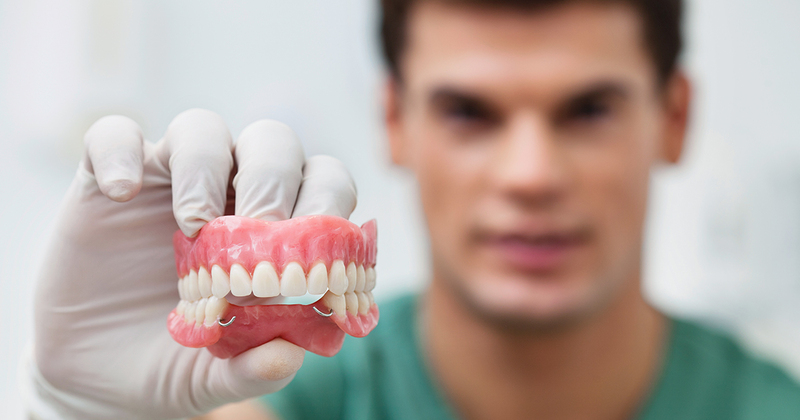 We offer affordable quality dentures that can replace your natural teeth. Our dentists can help you look great and resolve any gaps in your smile in an effective. We will work with you to determine your priorities and to ensure that our services are cost-effective for you. If you are looking for affordable options, we can help you with full or partial dentures that can be easily removed and that fill the gaps in your smile to enhance your appearance. We are pleased to be a trusted source for dentures in Rockledge and will work with you to ensure that you can afford the treatment plan we design for you. If you do not want to wait for a month or two to heal after your extractions, we can often provide a temporary denture to use while your gums heal. We can create partial or full denture devices to suit your needs. Flexible partial dentures are made from a more lightweight, pliable material and also move with your mouth making them appear much more natural. If you have sufficient bone left and some healthy teeth, implant-supported dentures may be the best way to manage your needs and to enhance your ability to bite, chew, speak and smile with confidence. Our dentists and administrators will work with you to ensure that you understand the cost of your dentures and the amount that will be paid by your dental plan or other applicable discounts. The cost of your treatment will vary considerably depending on a number of factors, including the amount of preparation needed, the type of denture you will receive and whether these treatments will involve implants and permanent attachment of your dental appliances. Regardless of the option chosen, our team will work with you to make sure your experience with us is as painless and as affordable as possible. The affordable quality dentures we offer are designed to replace missing teeth and to provide you with a uniform, beautiful smile. Removable dentures are held in position by the use of denture adhesive. Permanently affixed dentures, by contrast, are attached to implants in your jawbone that can allow you to enjoy the strength and convenience most often associated with your own natural teeth. Using soft materials to reline your existing dentures can sometimes enhance your comfort and improve the fit of these dental appliances. We offer reline services that can provide you with the best possible fit for your dental appliance. These relines must be replaced every two or three years to ensure the most comfortable fit for your dentures. Four dental implants serve as the foundation for All-on-Four dentures. These implants must be seated deep in the jaw to provide optimal performance and durability. Once the implants have been placed, your dentures will be affixed to these attachment points to create a permanent solution for missing teeth and to provide you with a healthier bite. If you are looking for dental care in our area, you can trust our dentists to deliver comfortable and attractive dentures and other services for you and your family. We will work with you to ensure that your care is affordable and tailored to suit your needs. Call us today to set up your first appointment. We look forward to meeting you and your family.